Oscar Wilde said, "I can resist everything but temptation." I think he had fresh figs in mind when he said that. Consider this: Yesterday morning at the Hillcrest farmers' market, I spotted close to a dozen people eating fresh figs as they shopped. That's because everything about fresh figs is irresistible -- their pleasingly plump stature, their velvet skin splitting with ripeness, their ambrosial pink flesh. Fresh Calmyrna figs grown in San Diego County. Despite fresh figs' high price tag, usually $4-6 per pound, San Diego shoppers couldn't get enough of them, including me. I also can't get enough of these simple, no-bake Greek Yogurt, Fresh Fig, and Black Currant Parfaits. This dessert proves that opposites attract -- sweet figs and tart black currants, syrupy honey and spicy cinnamon, and earthy rosemary and tangy lemon zest are enfolded in luscious, creamy Greek yogurt. I just know Oscar Wilde wouldn't have been able to resist them either. Black Mission figs grown in LA County. 1. Heat honey, cinnamon, salt, lemon zest, and rosemary either in the microwave or on the stovetop until warm and smooth. Remove from heat. 2. Use two cocktail or other pretty glasses to assemble parfaits. Start with yogurt at the base. Then top with fig pieces, currants, pistachios, and honey sauce. Repeat. Eat. Make again tomorrow. *Note: Black currants are small, round berries with a glossy black skin and tart flesh. They're available at farmers' markets and organic markets. If you can't find them, blackberries make a good substitute. Dried black currants are more widely available, but their flavor and texture is sweeter like a raisin. 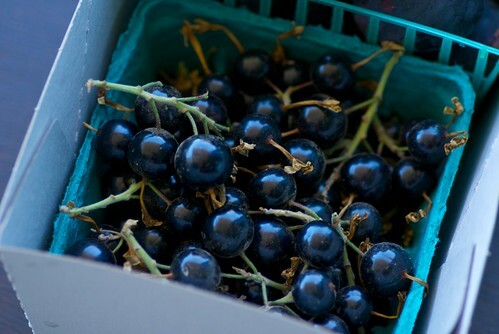 Fresh black currants grown in LA County. Good to know that it isn't just here that they cost an arm and a leg - that is what I assumed. But it doesn't keep me away either! I think I ate an entire pound by myself this weekend. I love figs and this parfait sounds like something I shouldn't miss! O M G that looks so good. i think i have to go on a fig hunt right. now. You are so lucky to have such a wonderful selection of fresh figs. Also, I must admit I find low-fat Greek Yogurt to be an incredibly delicious indulgence. How do they manage to make low-fat taste so good? I find figs to be thoroughly irresistible as well. But I figure, I'd rather have the figs than a half pound of meat. So it's a trade off. This parfait looks excellent! Filled with the farmer's market's finest. This looks so delicious, Susan! Like you, I can't get enough of those beautiful summer figs. Gorgeous photos. Thanks for this great idea. Can't wait to try it. I used to pick up Greek yogurt when I went to Seattle twice a year..imagine how I felt when they started carrying it here in K-rown. With the combination of figs this would be heavenly Susan. thefrench-I'm right there with you! joanne-I know what you mean. It's all about indulging on the most irresistible treats. If figs trump cheeseburgers, so be it! patrice-We're going to get along just fine. Very nice recipe and the photos are excellent. I found your blog through a friend this morning and plan on keeping an eye on it. 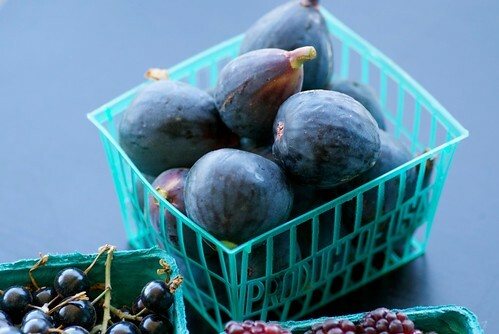 The fresh fig season will be coming to an end soon, but dried figs are available all year long in your local grocery store and at www.valleyfig.com. 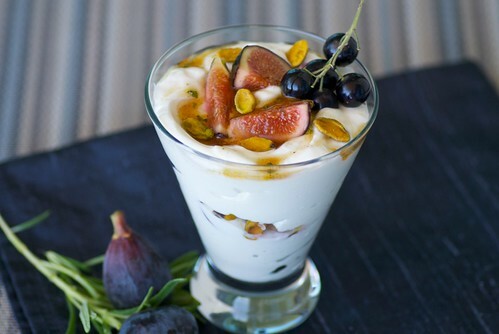 I agree that Oscar Wilde was talking about figs :) This looks like my dream parfait! 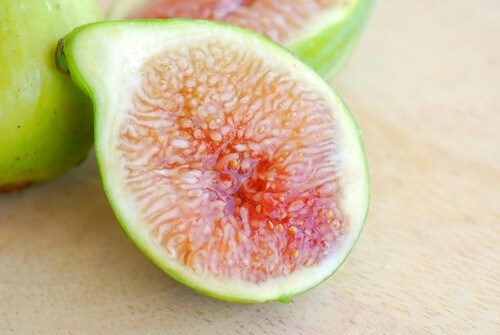 I want to eat fresh figs. I really do. I've never seen them for sale in KY where I used to live, and haven't seem them in Nashville where I now live either. Sigh..... I did buy some in a little container when I went to Jungle Jim's International Market in Ohio. Sadly, they did not taste good. I do not fault the figs, I fault the store and time of year. I do love black currant flavored things, though I've never tried fresh black currants. Maybe I will be able to one day. If the black currant bushed I planted ever bear fruit that is. The happiest times in my garden is when my fig tree is full of beautiful ripe purple figs. Heavenly. this looks divine! i'm jealous of your currants since none of my local grocers seem to have any thus far. as soon as we get some, i'll be enjoying this dessert! What a great idea. I was wondering what to do with all the figs at the farmers markets right now. Lovely photos!